You won’t believe what can be done with a tiny house and a greenhouse. A Greenhouse is built around this tiny house to warm it naturally. It’s a pretty interesting yet brilliant idea, and it completely changes the way this Swedish family lives. It makes sense as a way to keep your tiny home warm in an energy efficient way all year long. For most people in northern climates, the winter months can be cold and dark, and that means finding creative ways to stay warm, for some that might mean having a wood stove inside that creates additional heat or even having multiple sources of heat. Some people have electric, gas and wood fire heating in their homes especially if they are off-grid. That way they always have a backup heat source if one of them isn’t functioning properly. 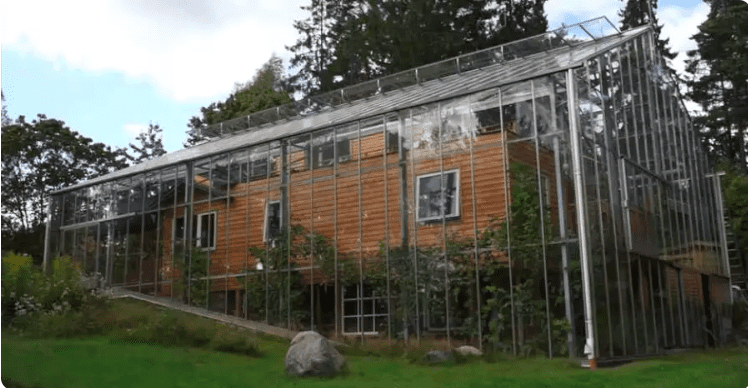 Building a greenhouse around your already existing tiny house as a way to heat it up might be an uncommon method, but it’s a very smart method. It’s also a big project, but for the Granmar-Sacilotto family who lives near Stockholm, Sweden it was a very wise move. The family renovated an existing summer home and added a greenhouse structure outfitted with single pane glass around it. This interesting concept was first thought of by Swedish architect Bengt Warne in the 1970s and was called Naturhus, which translates to Naturehousing. Marie Granmar and Charles Sacilotto, are the owners of this unique tiny home and were inspired by Warne’s work, so they built their version of the Naturhus several years ago. So they found a property that already had an existing summer tiny house and built a conventional greenhouse around it. The building project cost them approximately $84,000. The original idea behind the Naturhus was to create a type of home that would collect the sun, so the flows of nature could be best utilized to produce energy, air, cleaning water and compost in the climate of Scandinavia. The tiny home of the couple follows the same principles of this concept. They built their own centrifugal wastewater treatment system so that the solids could be separated from the urine; it would then be purified by plants and sent to the couple’s garden. The greenhouse also manages to lengthen the growing and gardening season of the area, so they can grow Mediterranean plants such as figs while at the same way also cutting down on heating. The exterior spaces of the tiny house were once exposed to the outdoor elements, are now able to be used all year long. From the outside deck to the rooftop patio, which was changed from being just a roof to outdoor living space that can be used all year long. This Naturhus is an innovative idea that is not only an amazing way to keep the tiny house warm, but the tiny house is also protected from the elements. This type of house would not work in climates that are extremely hot and sunny but works for tiny house and homes that are colder. It works for northern climates and can offer a great alternative to cut down on heating bills and to extend the growing season and be more self-sufficient. What an innovative idea, it will be interesting to see if more people catch on and more of these types of homes are built as the years go on.